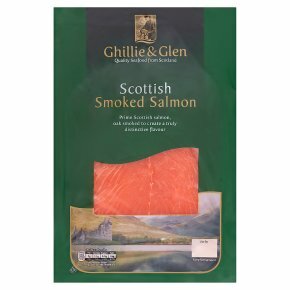 Premium farmed smoked salmon from the fast flowing waters around the West Coast and Islands of Scotland. Oak smoked to create a truly distinctive flavour. Serving Suggestion Ideally separate slices 30 minutes before serving to allow the salmon to reach room temperature. This will help restore the salmon to its optimum eating quality. Try serving on a lightly toasted bagel with scrambled or poached eggs, pour over some warmed Hollandaise sauce or add some cooked spinach. Caution<br>Although every care has been taken to remove all bones, some bones may remain.